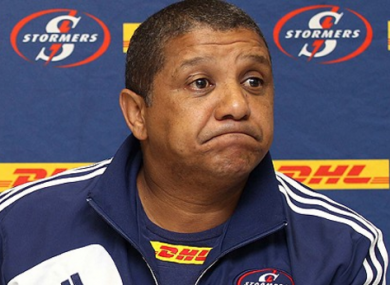 ALLISTER COETZEE IS finally expected to be named coach of South Africa today, four months behind schedule. An announcement set for last December was pushed back to early April, then postponed again with no official explanation for either delay. South Africa host Ireland during June in a three-Test series. The national rugby union chose a “preferred candidate” rather than advertise the post and the media is convinced Coetzee will become the second black coach of the Springboks after Peter de Villiers. One weekend newspaper devoted a page to a profile of the 52-year-old who coaches Japanese club Kobelco Steelers after six years guiding Cape Town-based Super Rugby outfit Western Stormers. Another carried articles in favour and against Coetzee succeeding Heyneke Meyer as handler of the twice world champions, who finished third at the 2015 World Cup in England. When moderately successful Meyer opted against seeking a renewal of his four-year contract, Coetzee quickly became the media and public favourite for the job. He assisted head coach Jake White when South Africa last won the World Cup nine years ago, beating England 15-6 in the final in Paris. Appointed Stormers coach in 2010, he established them as the consistently strongest South African side in Super Rugby. Supporters of Coetzee say getting the team to the knockout stage regularly proves the diminutive former scrum-half is worthy of the Springbok post. “His failure to win a Super Rugby title is held against him, but he forged them into a competitive playing unit,” noted former Springbok centre Brendan Venter. Detractors of Coetzee say his overly defensive tactics were largely to blame for the Cape outfit never winning the competition. “Coetzee, for all his experience as Stormers head coach and Springboks assistant coach, does not rank among the 10 best coaches (in the world),” wrote columnist Mark Keohane. Assuming he gets the nod, Coetzee must make South Africa regular winners again after five losses in 11 Tests last year, including stunning reverses against Argentina and Japan. A humiliating 34-32 World Cup group defeat to second-tier Japan in Brighton was the biggest shock in the quadrennial competition since its 1987 inception. He will be expected to improve on a dismal record under Meyer against the No. 1 team in the world, the All Blacks, who have beaten the Springboks seven times in the past eight Tests. Coetzee will also be expected to alter the predominantly white face of Springbok rugby with Meyer including just three blacks in his first-choice World Cup team last year. Only about 10 per cent of the South African population is white and the rugby union and the government have signed an agreement that half the 2019 World Cup squad should be black. Coetzee regularly chose Stormers teams that were close to 50 per cent black and his legacy lives on under successor Robbie Fleck. Stormers had six black starters in Super Rugby at the weekend, Southern Kings five and Coastal Sharks, Golden Lions and Northern Bulls three each. The sixth South African franchise, Central Cheetahs, had a bye. Email “South Africa set to finally confirm new boss after bizarre delay”. Feedback on “South Africa set to finally confirm new boss after bizarre delay”.